Because the 2018 harvest limit for lake trout in Grand Traverse Bay was exceeded, the Michigan Department of Natural Resources is looking at some regulation changes for 2019. Before any changes are proposed to the Michigan Natural Resources Commission, which has the authority for establishing most regulations, the DNR is inviting the public to learn about options during a meeting Wednesday, March 6. Due to strong public interest, the location of this meeting has been changed. It originally was scheduled for 6 to 8 p.m. at the DNR Customer Service Center in Traverse City, but now will run 6:30 to 8:30 p.m. at the East Bay Township Hall, 1965 North 3 Mile Road in Traverse City. Each year, lake trout harvest limits in 1836 Treaty-ceded waters are determined by the treaty tribes, the United States and the state of Michigan. Last year, the state recreational harvest in Grand Traverse Bay (known as the Lake Trout Management Unit MM-4) reached 93,000 pounds – exceeding the set total allowable catch of 77,200 pounds. Grand Traverse Bay’s lake trout fishery is a popular opportunity for many anglers. In recent years, fishing methods have moved beyond trolling and now include casting and jigging, too. According to Heather Hettinger, a DNR fisheries biologist who works out of the Traverse City Customer Service Center, this strong fishery, combined with increased interest in bass and cisco fishing, means more anglers are targeting lake trout. That increased effort and alternative methods for catching lake trout result in more fish being caught and released than in the recent past. Anglers can directly improve the state’s ability to stay within lake trout harvest limits in Grand Traverse Bay by targeting other readily available fish species or stopping their fish outing after reaching the daily possession limit of lake trout. The March 6 meeting in Traverse City is open to everyone. Those unable to attend are encouraged to contact Scott Heintzelman, 231-775-9727 or Heather Hettinger, 231-922-6056 with questions or suggestions. 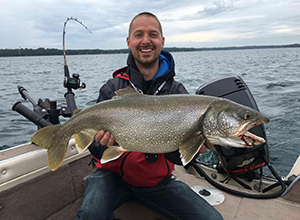 IMG-2510-lake trout.JPG: Anglers fishing for lake trout on Grand Traverse Bay in 2019 will soon have new regulations to follow.